St. Joan Margaret School in Tabarre, Haiti, is a very special place. This school educates children with extra special challenges—everything from vision, hearing, speech, and developmental disabilities. Children with disabilities can be looked down upon—in any culture really. Think about it, even in the States expectant families will often say, “We don’t care if the baby is a boy or a girl, we just want a healthy baby.” There’s nothing wrong with wanting a healthy baby, but there is an implicit bias in that statement against babies we might deem “unhealthy.” With that in mind, it’s easy to imagine the discrimination that can occur in an impoverished area, as is much of Haiti. Many children with disabilities here don’t even get the opportunity to go to school for various reasons. One reason is that poor families struggle to educate their abled children as it is, and if they must choose between which child to educate, the abled child can more easily and accessibly go to school. The other difficulty is location. 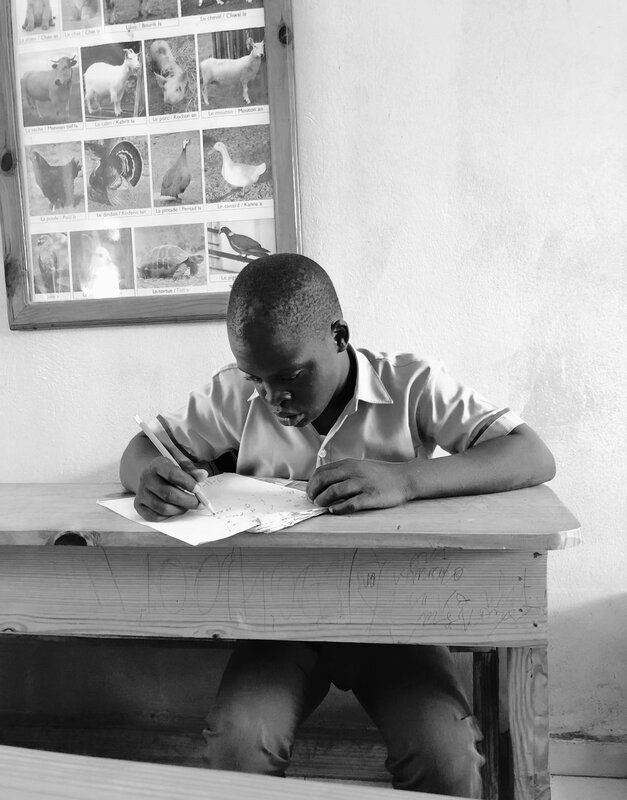 In Haiti specialized schools for the deaf, blind, and mute are few and far between. There are few schools throughout the country that will enroll children with disabilities, and even fewer designated especially to their education. Shortly after the earthquake in 2010, Madame Judith, the school’s director, helped start St. Joan Margaret school for the blind, deaf, and developmentally delayed. She had previously worked with another special needs school that sadly fell during the earthquake. With the limited resources following that earth shaking event, the school started out in a shipping container. Thanks to our wonderful partner, The Rava Foundation in Italy, we were able to build a beautiful school with nine classrooms for children in pre-kindergarten to 6th grade. St. Joan Margaret now provides primary education for over 190 children, 80 of whom have hearing disabilities, and 12 of whom have vision impairment. The rest of the children experience other handicaps or delays such as microcephaly or Down’s syndrome. After the children have completed their primary education, and if they are able, the children can integrate into our local secondary school, Academy for Peace and Justice (APJ). Social reintegration of children with disabilities is a huge part of the vision for St. Joan Margaret school. That is why we try to integrate children with disabilities into APJ with other children. Our hope is that by empowering children with physical challenges, they will be able to show the world their abilities and competencies within society. The integration into APJ is important because not only does it give children with disabilities the knowledge that they can play integral roles within a community, but it also challenges the mentality of the culture overall. Virlanda, Junior, and Stevenson, three children with vision impairment, will soon integrate into the Secondary School. They currently attend Madame Jacques’ 6th grade class alongside other children with various levels of ability. Many of these other children are able to communicate using sign language. Virlanda, Junior, and Stevenson use typewriters to answer the math problems that Madame Jacques gives them. They also explain that they use a special slate that has many little cubicles to calculate math problems. The little cubes that fit inside the cubicles have braille markings on each side. Someday, Virlanda would like to teach other children with vision disabilities. Junior wants to study psychology, and Stevenson would like to study general engineering. They are all so polite, respectful, and eager to learn. In another classroom, Mr. Ercel Sylias, a vision impaired teacher, helps teach vision-impaired children how to read braille. He would like to know how programs for children with disabilities work in places like the United States. Perhaps a school there could partner with St. Joan Margaret to share resources, ideas, and culture between the students and the staff members of both schools. Mr. Muller Lundi, who describes himself as having low-vision, also teaches at St. Joan Margaret. He demonstrates the many aids the school has for children who also have low vision: magnifying glass, computer, typewriters, an electronic magnifier that can change the letters being magnified from black with a white background to white with a black background. He also explains how a sheet of braille writing is produced with a Perkins Brailler. Someday he would love for the school to have a music program for the children, because music is such a powerful way for people to express themselves--especially persons with special challenges. Although there is much suffering in Haiti, particularly experienced by the most vulnerable, St. Joan Margaret is an oasis of hope in a dry and weary land. The children there are loved. The school is breaking down mentalities that children with disabilities aren’t worth educating. The teachers may be explaining roman numerals on a day-to-day basis, but really what they are teaching is hope.